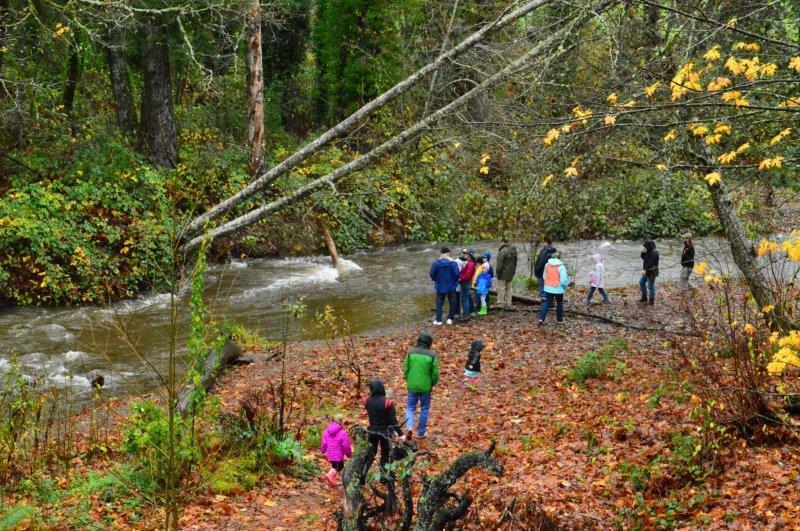 Bring family and friends to celebrate the return of salmon to Kitsap streams at these FREE events! It may be raining, but we’ll be there rain or shine. Please dress for the weather, wear comfortable waterproof shoes, and exercise caution when parking and/or crossing roads. Some sites involve a hike to the stream (especially the Rhododendron Preserve). 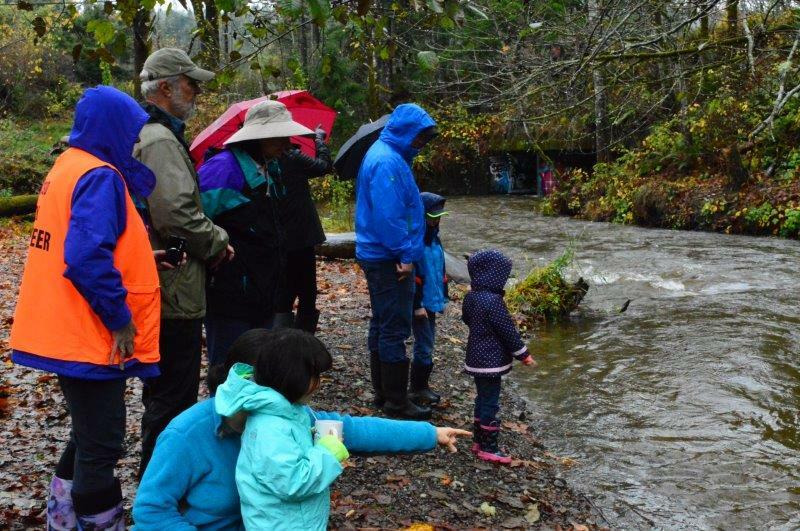 Activities will be available for all ages and include informational booths, refreshments, and trained salmon docents who are present to assist in viewing and identifying salmon in the stream. Biologists will talk about the various types of salmon in Kitsap, the salmon life cycle, and healthy fish habitat. Wheelchair accessible during the event, gate prevents access at other times. Come see the results of restoration work on the lower reaches of Chico Creek. A new trail allows people to reach the delta, a popular fishing spot during salmon runs. 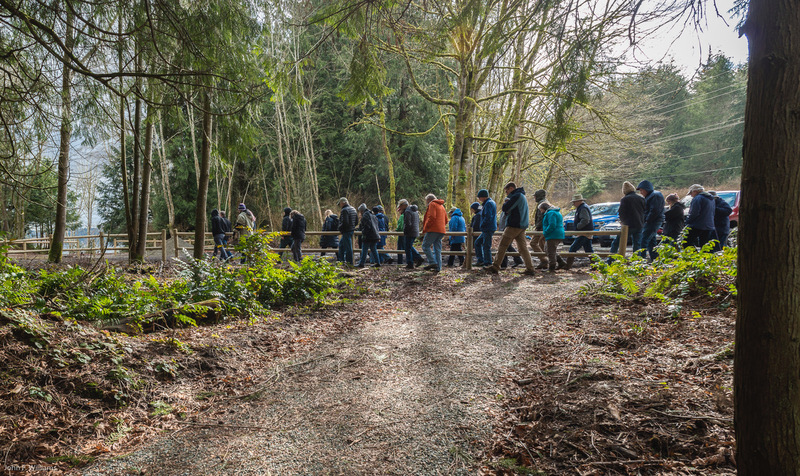 Walk the trail to view returning salmon and talk with experts from the Great Peninsula Conservancy and Washington Dept. of Fish and Wildlife about this restoration project. 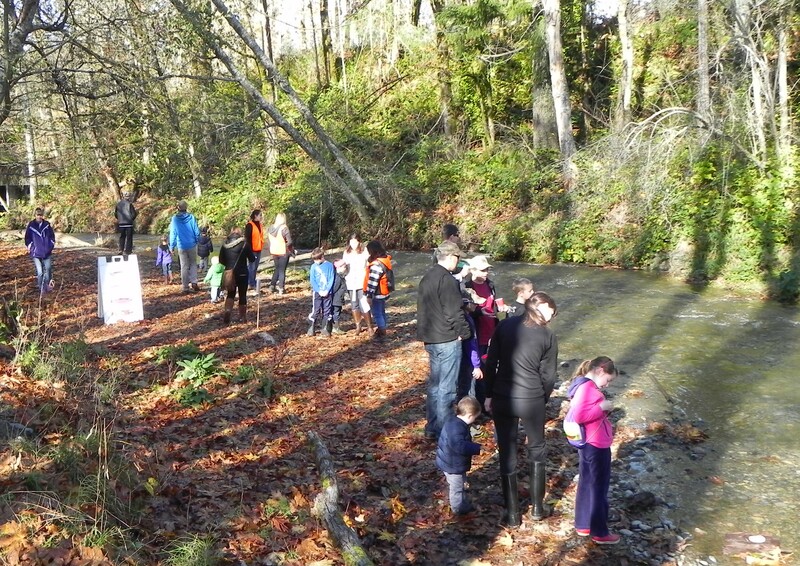 Since the Clear Creek Task Force built their first trail in 1994, their mission was to preserve the creek and educate the community about healthy salmon habitat. With the Bucklin Hill Bridge 240 ft. span replacing two 72” culverts, salmon no longer have to wait for high tide to swim upstream to spawn. Activities at the Ridgetop picnic pavilion include storytime with Silverdale Librarian Aleah Jurnecki at 11:00 and 1:00pm, potential citizen scientists can talk with experts on macroinvertebrate identification and learn about the results of the five year water quality monitoring of Clear Creek. Salmon Docents are on hand to share information on the various types of salmon in Kitsap, the salmon life cycle, and healthy fish habitat. 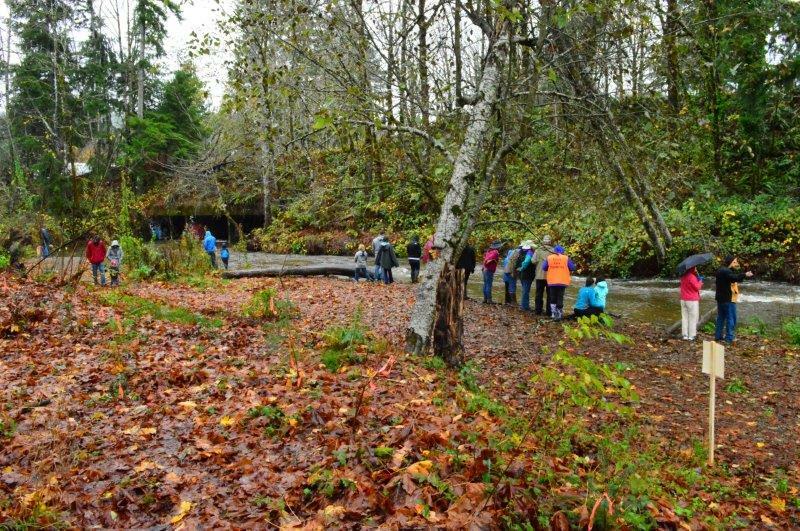 Join the Suquamish tribe and Friends of Miller Bay to learn about the importance of salmon to the Suquamish people, the role habitat plays in salmon survival, and what we can do to protect and restore habitat for these animals. Join the City of Bremerton to learn about stormwater pollution prevention and gain insight into how the Gorst Creek Restoration Project was planned and implemented. 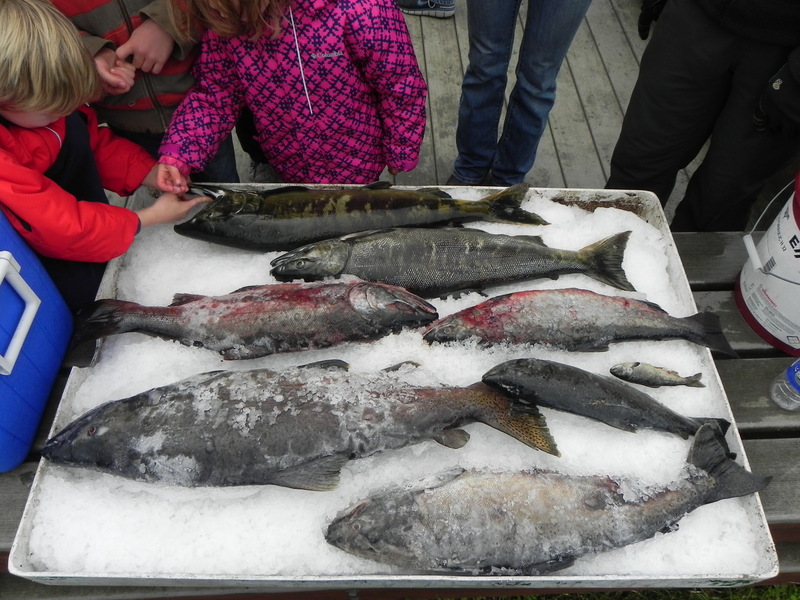 The Kitsap Poggie Club will help you find the best salmon viewing opportunities, teach about fish anatomy, lead an interactive salmon adventure, offer fly tying demonstrations and discuss salmon stewardship. Biologists will guide hikes down to the Creek. The first tour begins at 10am, the last tour begins at 1pm. Join a tour to learn about the salmon life cycle and hopefully catch a glimpse of a salmon plowing through the creek. The hike is through a rare old growth forest preserve, over rough and steep terrain (1.5 mile round-trip). After the tour, warm up by the cozy fire in the historic Kitsap Cabin and enjoy refreshments. Come witness these special displays of nature. Domestic pets like dogs are not allowed in the preserve. 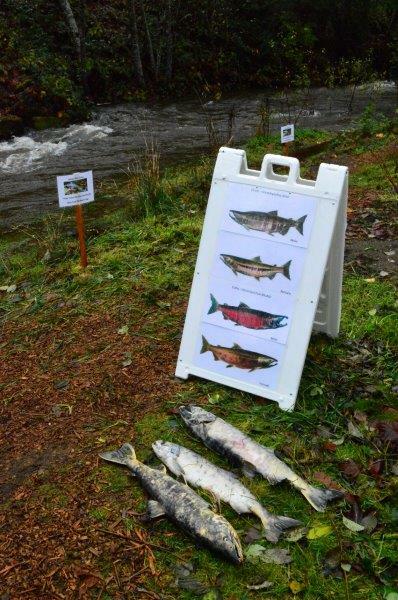 Activities will be available for all ages and include informational booths, arts & crafts, and viewing salmon in the stream. Salmon Stewards and Biologists will talk about the various types of salmon in Kitsap, the salmon life cycle, and healthy fish habitat. Please park across the street from Poulsbo’s Fish Park in the Nelson Park or EHL Parking lot and walk down the trail under the Lindvig Bridge. It’s a great walk along the shoreline! At this site where Dickerson Creek branches off from Chico Creek you can watch salmon choose their stream based on where they were born. A picnic shelter lets you enjoy the stream restoration completed in 2016, rain or shine. WSU Extension programs and employment are available to all without discrimination. Evidence of noncompliance may be reported through your local WSU Extension office. Reasonable accommodations will be made for persons with disabilities and special needs who contact Amy Brodbeck at 345 6th Street, Suite 550, Bremerton, WA 98337 360-307-4378 abrodbeck@co.kitsap.wa.us at least two weeks prior to the event. Feel free to download, share, print, and laminate these high quality educational resources, which have been designed to work together or stand alone. Please do not edit or alter the publications, graphics, or wording of these copyrighted materials.